Once you buy a food truck, your next step is to choose what kind of equipment you'll put in it. Whether your food truck has existing equipment or you're starting from scratch, it's important to make the most of its compact space and ensure that you'll have everything your business needs. Below, we have provided a comprehensive list of food truck equipment to help you get your truck ready for service. 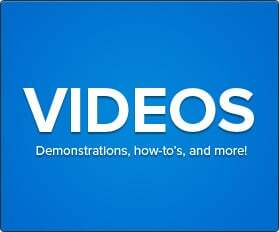 Use the links below to jump to the section you’re interested in. If you'd like to download a pdf of our food truck equipment checklist, click the button below. When you're buying equipment for your food truck, you can expect to devote the bulk of your budget to cooking equipment. To optimize your food truck kitchen, you can select a mixture of countertop and full-size models. Devote more space to your most-used equipment and stick with countertop alternatives for appliances you will use less often or for smaller quantities of food. Griddle or Flat Top Grill: Griddles and grills are ideal for cooking popular items like pancakes, burgers, eggs, and vegetables. 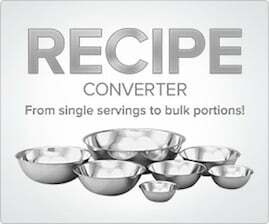 Range: Ranges allow you to pan fry, saute, boil, and simmer anything from your proteins to your sauces. Charbroiler: Charbroilers help you to achieve grill marks and the signature “grilled” flavor on chicken, steaks, vegetables, and more. Microwave: You can use a microwave to reheat sides or even steam vegetables. Toaster: With a toaster, you can get the perfect texture on bread for sandwiches or breakfast items like waffles, English muffins, and bagels. Salamander or Cheese Melter: Salamanders help you to brown the tops of foods like open-face sandwiches and macaroni and cheese. Plus, you can efficiently melt cheese on casseroles. Fryer: A fryer is an essential item for many food trucks, allowing you to cook popular menu items like french fries, chicken tenders, and onion rings. 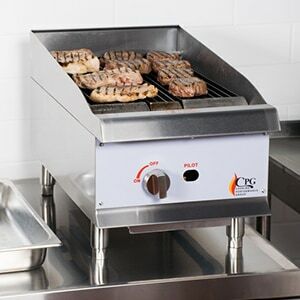 Warming and holding equipment is imperative for keeping your food at safe temperatures. Not only can these pieces of equipment help you avoid foodborne illness and health inspection violations, but they also hold your menu items at appetizing temperatures for your customers. Countertop Food Warmer: A countertop food warmer is a versatile addition to your equipment, and it can keep foods like pasta, vegetables, and casseroles at safe temperatures. 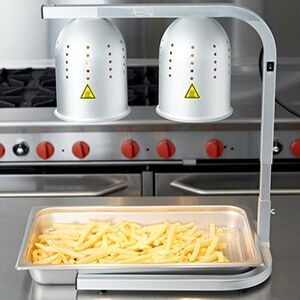 Fry Dump Station: Use a fry dump station to keep your fries warm once they’re out of the fryer. Soup Warmer or Kettle: Soup kettles ensure that your soups remain hot until they’re ready for serving. These supplies will be some of the most-used items in your food truck. 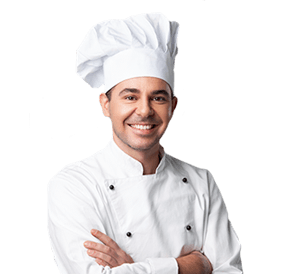 Food prep equipment covers anything you use to get food ready for cooking or serving, so what you need will vary depending on what you have on your menu. Stainless Steel Work Table: Depending on your food truck’s counter setup, you may want a stainless steel work table for added prep space. Cutting Boards: Whether you’re dicing, chopping, or slicing, cutting boards are an essential for every kitchen. Knives and Knife Rack: Purchasing good quality knives will save you replacement costs in the long run, and having a rack or roll to store them safely is ideal for a compact kitchen. Skillets or Frying Pans: Use these to pan fry, saute, or even steam your menu items. Sauce Pans: Sauce pans help you to reduce, simmer, and boil sauces and broths. Turners: Turners are another versatile item that can be used for anything from burgers to vegetables. Thermometers: If you want to keep your customers safe, use thermometers to ensure that all of your food items are cooked thoroughly. 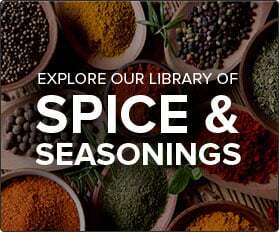 Blender or Food Processor: You can make smoothies, salsa, sauces, and soups with the help of a blender or food processor. 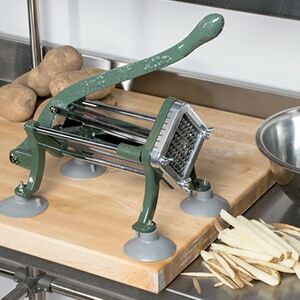 French Fry Cutter: A french fry cutter will save you plenty of time if your food truck has fries on the menu. Because your food truck will serve on-the-go customers, you’ll need to stock up on a number of disposable serving supplies. Be sure that you have ample room to store these supplies in your truck, because running out of them could mean that you have to close your window for the day. Serving Utensils: Whether you need spoons, ladles, or tongs, always make sure to have clean serving utensils on hand. Pump Condiment Dispenser: You can put a pump condiment dispenser outside of your truck for self-service, or opt for one inside for more portion control. Squeeze Bottles: These bottles will help you top your menu items or allow guests to put condiments on for themselves. Sugar, Spice, or Cheese Shakers: With sugar, spice, or cheese shakers, you can dust your offerings with the appropriate toppings. 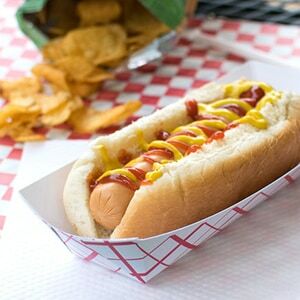 Paper Food Trays: Paper food trays are a classic option for serving your food truck’s main and side dishes. Paper, Foam, or Plastic Dinnerware: If you offer platters or large portions, disposable dinnerware is the way to go. Paper or Plastic Cups: Paper or plastic cups allow you to serve beverages outside of bottles or cans. 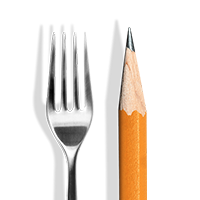 Plastic Utensils: An essential for every food truck, plastic utensils help your guests to enjoy their food. Take-Out Containers: Take-out containers make it easy for on-the-go customers to transport their food. Portion Cups: Portion cups allow customers to take just the right amount of condiments for their food. Paper Napkins and Dispenser: Put a napkin dispenser outside of your truck for guests to help themselves. Guest Checks or Order Forms: Guest checks and order forms will help you stay organized as you prepare orders. Disposable Gloves: With disposable gloves, you can handle food sanitarily. 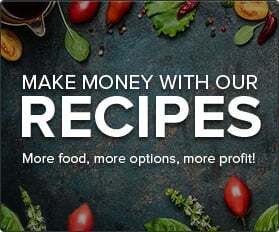 Aluminum or Plastic Food Wrap: Whether you need to wrap prepared servings or store ingredients for later use, aluminum or plastic food wrap will come in handy. Having some sort of refrigeration equipment on your food truck is imperative for keeping ingredients fresh. You may want to have one refrigerator for your main food items, a separate one for beverages, or a smaller refrigerator for things like sauces and toppings. Fortunately, refrigeration equipment comes in a variety of types, so you can customize the unit(s) you choose to your food truck’s offerings. Worktop or Undercounter Refrigerator: A worktop refrigerator doubles as a work surface, which is optimal for your compact space. Sandwich or Salad Preparation Refrigerator: A sandwich or salad prep refrigerator has a bottom chilled cabinet, top with space for pans of toppings, and a strip of prep space for assembly. Pizza Preparation Refrigerator: Pizza prep refrigerators are similar to sandwich preparation models, but they offer a larger workspace for you to easily assemble your pizzas. 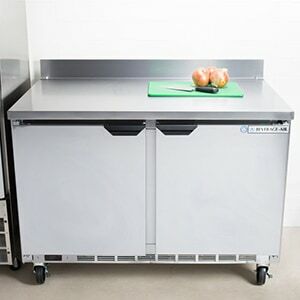 Countertop Glass Door Refrigerator: A countertop glass door refrigerator is an excellent solution for merchandising canned or bottled beverages in your food truck. Janitorial equipment is essential for keeping your food truck clean and sanitary. These supplies will be used at the end of every day and maybe even at some points during service, so make sure to stock up on all the items you need. Three-Compartment Sink: If you have the room, a three-compartment sink is ideal for washing, rinsing, and sanitizing your dishes and smallwares. Hand Sink: A dedicated hand sink encourages your employees to practice good personal hygiene and keep your food safe. Anti-Fatigue or Wet Area Floor Mats: These mats will help to cushion the area you stand on every day and protect you from slipping. Sanitizing Chemicals: You can find sanitizing chemicals intended for both surfaces and dishware. 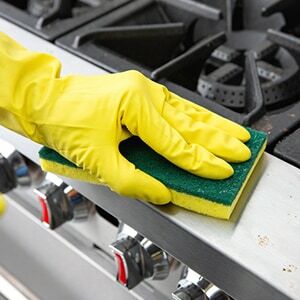 Scrubbers and Sponges: You’ll need scrubbers and sponges to keep dishware and cooking utensils clean. Trash Can and Liners: Keep your waste disposal area tidy with a large bin and plenty of liners. Broom and Dustpan: A broom and dustpan is perfect for keeping the floor of your food truck tidy. If you're looking to start a food truck business, one of your first steps is to get familiar with the types of equipment you'll need. Prioritize space for your cooking equipment, but keep in mind that you'll need plenty of room for disposables and prep supplies as well. Refer to this guide to ensure that you have all the equipment that your food truck needs. Click the button below to find the downloadable PDF of our food truck equipment checklist.